Experts estimate that you’ll spend about a third of your life sleeping, meaning you’ll use your pillow for over 2,500 hours this year alone. Knowing this, we think you’ll agree that your pillow is so much more than just a piece of bedding to lay your head on at night. It’s an important ingredient to your overall happiness, health, and well-being. When you lay down and rest your heavy head after a long, stressful day, it’s important to make sure your mind and body are completely relaxed so that you can drift off into a truly deep, restorative sleep. 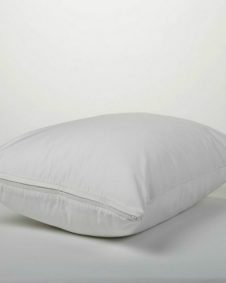 Investing in wool pillows is a great start towards achieving a healthy bed and a natural sleeping experience. How to Choose the Best Pillow? Choosing the best all-natural pillow for you is a personal choice. Each person has their own unique sleeping style. 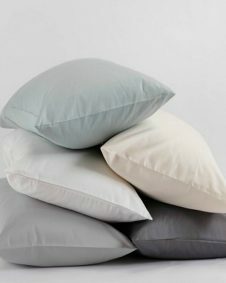 If you buy the wrong type or size pillow, it can result in a fitful night’s sleep or waking up to cricks in your neck. Over time, this can have a negative impact on your overall health, which is why choosing the right pillow is so important. Stomach and back sleepers may prefer a lighter, flatter pillow with less filling, while side sleepers tend to benefit more from the neck support of a fuller, loftier pillow. For combination sleepers, try multiple options and see what works best for you. Whether you prefer sleeping on your side, back or stomach — or you’re a combination sleeper that rolls around in the night — our 100% certified organic wool-filled pillows are handmade and synthetic free to help ensure you sleep your natural best. Why Splurge on a Natural, Organic Pillow? 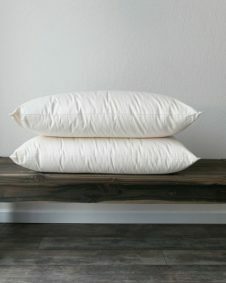 Made with organic wool batting sewn into an organic cotton encasement, our pillows are luxuriously soft yet firm enough to provide sufficient neck support. Designed to compress about 30%-40% within the first six months of regular use to increase longevity, our pillows provide maximum beneficial sleep support for longer than lower quality products. Wool is naturally resistant to mold, mildew, and dust mites. As a hypoallergenic material, wool is often the bedding of choice for people who suffer from allergy sensitivities. Our pillows offer relief and a better night’s sleep. Wool is great at regulating temperature by promoting regular airflow. For this reason, wool-filled pillows stay cooler than most other pillows and allow your body to peacefully enter into sleep. Since wool is a naturally wicking material, it also prevents moisture from building up, which is beneficial to people who experience night sweats. Buying our 100% certified organic pillow is beneficial for your health and the planet because it’s made from all-natural materials with zero toxic chemicals or synthetics — unlike latex, memory foam, polyester, and gel pillows. Our pillows are handmade with sheets of organic wool batting surrounded by an organic cotton sateen case, ensuring maximum comfort and support. Wool naturally helps you relax, relieving stress and tension throughout your body. At Shepherd’s Dream, our philosophy is different from other bedding companies in that all of our products are 100% chemical-free, pure lambswool, and American made. We stand behind using only the highest quality materials and engaging in environmentally-responsible, sustainable production techniques and industry practices. Our pillows aren’t the only way we help enhance your sleeping experience. Be sure to also check out our wool mattress toppers, mattress pads, merino wool blankets, comforters, and organic cotton sheets to see how we help you sleep your natural best!